The Post and Telegraph (P&T) Department played a crucial role in New Zealanders’ experience of the First World War. Men enlisted at their local post office, or received telegrams telling them they’d been called up. Training camps were awash with mail – Featherston’s post office was the fifth busiest in the country. In 1915 the average New Zealander posted 112 letters & postcards and sent 12 telegrams. Only 6% of homes had telephones. Soldiers overseas were linked to their families by the military postal system, which aimed to deliver a morale-boosting package to each man every month. News of injury – or worse – was broken to loved ones by telegrams delivered by bicycle. The amount of money held by the Post Office Savings Bank soared during the war. Many soldiers had their pay deposited directly in the POSB. Nearly 3000 P&T employees signed up for the New Zealand Expeditionary Force (NZEF); 234 of these men died. Some sorted mail in cramped dug-outs, laid telephone lines to the front, or operated bulky field wireless sets in places like Mesopotamia (Iraq). 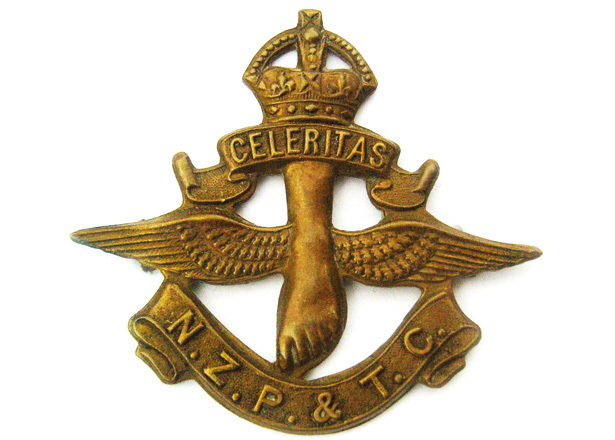 P&T men served throughout the NZEF – in the infantry, artillery and mounted rifles as well as in administrative positions. Auckland lineman James Crichton was a private in the Auckland Regiment when he was awarded a Victoria Cross for bravery under fire. P & T staff members also received one Distinguished Service Order, eight Military Crosses and 30 Military Medals. This article was commissioned by New Zealand Post. We have 23 biographies, 40 articles, related to The Post and Telegraph Department at war.